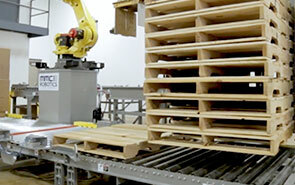 For most of the robotic palletizing lines that we design, we either integrate one of our automatic pallet dispensers or create customized end-of-arm tooling so that the pallet dispensing process can accomplished by the robot. 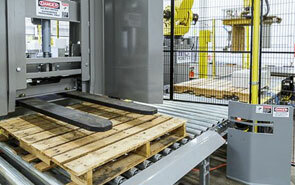 MMCI's FD-1500 and FD-2000 represent the evolution of the automated pallet dispenser. Tapping into our experience integrating hundreds of pallet dispensers into material handling systems, we designed these machines to provide greater flexibility, operate more reliably and lower the overall cost of the pallet handling process. To create a more flexible design, the FD-Series pallet dispensers were engineered with the same full-size forks used on most fork trucks. This innovative design allows the machines to easily accommodate a variety of pallet sizes and is even forgiving when it comes to pallets with structural deficiencies such as missing boards - a common problem with most other pallet dispensers on the market. Next, all critical functions are powered by reliable, low-maintenance electric motors that provide a more consistent speed than chain-driven or air cylinder-powered mechanisms. In fact, the main lifting mechanisms utilize motor-driven screw jacks with capacities of 3,000 pounds to ensure the machines can handle even the toughest applications quickly and efficiently. All of this technology integrates with a structurally superior framework made from durable 3/8” sheet metal that can accommodate 15 to 20 pallets depending on the model. 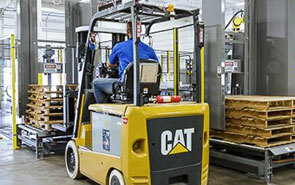 Plus, the innovative design improves safety and efficiency by allowing pallets to be loaded and unloaded by forklift while the machine is in operation.. Engineered to perform and with a compact design, the FD-Series automatic pallet dispensers are sure to improve the efficiency and lower the ongoing costs associated with your material handling system.